Hiring? 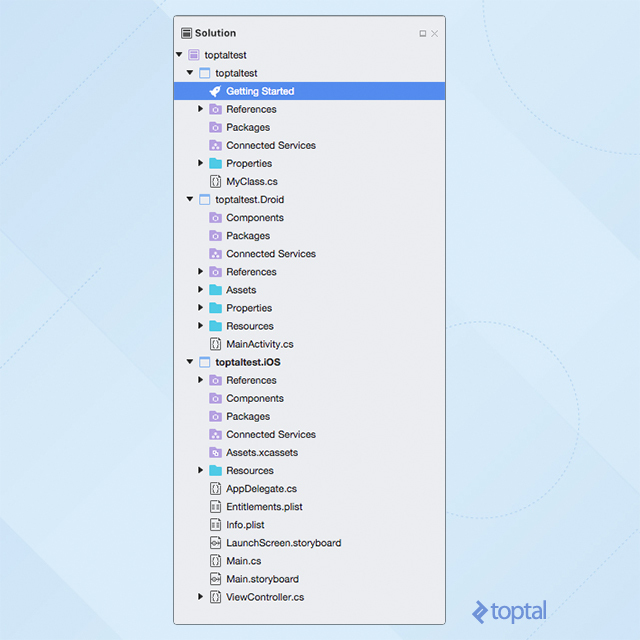 Toptal handpicks top C# developers to suit your needs. Demir is a developer and project manager with over 15 years of professional experience in a wide range of software development roles. Once upon a time, there was a company that had all the best tools, and writing software for their platform was awesome. But slowly, they became indifferent to their own problems. They did not become alarmed when their systems crashed, but rather accepted this state of the universe as a fact of life. They believed that their programs were perfect within themselves, serene and elegant, their purpose self-evident. It was well overdue when they realized their mistakes and their CEO cried to bring back all the developers who left their platform and sailed away. The company was Microsoft and I, for one, was convinced that their fate had been sealed and that they would slowly but surely perish from the forefront of the technology landscape. I’m so happy that I was wrong! In the past few years, Microsoft has pulled a few aces from up their sleeves. Yes, they messed up Skype (I still hate them for that), failed with smartphones, and almost succeeded with tablets. But, they did some really amazing things as well. 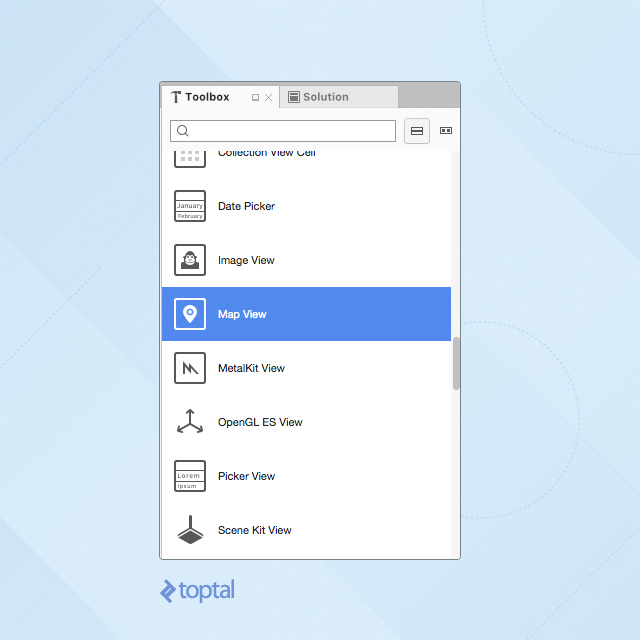 Relinquishing their closed empire approach, they open-sourced .NET, joined the Linux Foundation, released SQL Server for Linux, and created this great new tool called Visual Studio for Mac. That’s right, a real Microsoft IDE not for Windows, but for Mac. Imagine that! 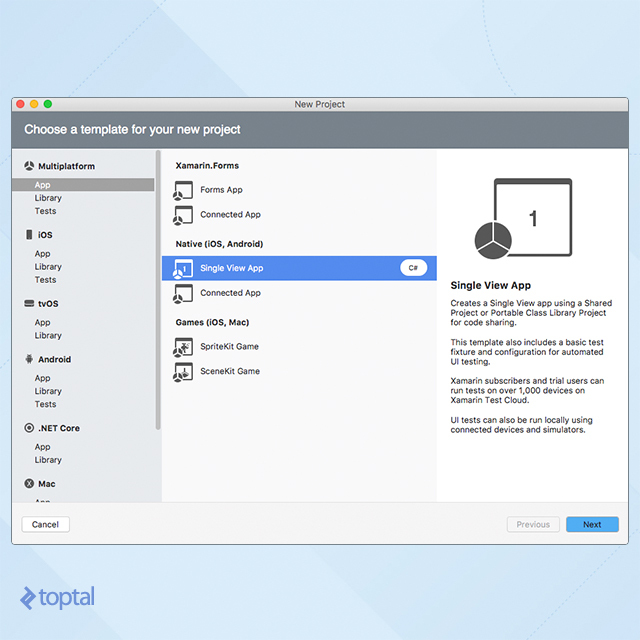 You can use Visual Studio for Mac to create almost any type of the application. It can be iOS, tvOS, Android, Mac, .NET Core, or even ASP.NET. 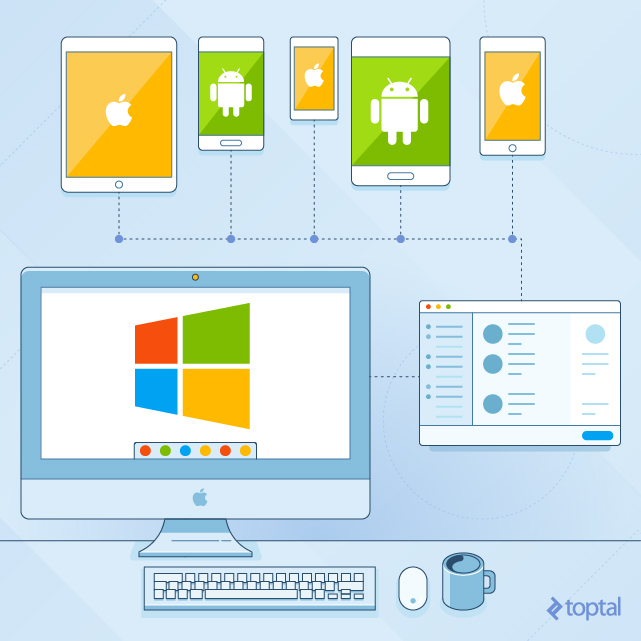 As all the cool kids are now writing mobile apps, lets see what it takes in Visual Studio for Mac to create a C# application that will run on Android and iOS. After filling in the package name and bootstrapping your app, Visual Studio will create a solution with three projects. The first project will be a shared library where you should keep the platform-independent code, and the other two will be Android and iOS apps. You can use the “Run” menu, or commands in the application bar, to start your app. Congratulations! You are now an iOS and Android developer regardless of the fact that you never wrote a line of Objective-C, Swift, or Java code. We haven’t really accomplished much yet with our app though. Let’s make things more interesting and incorporate maps and location services. Have in mind that VS for Mac is still in “Preview” and there is not much help and documentation you will find on using it. The best place for references on how to do things is still official Xamarin documentation. Visual Studio For Mac does not use the same solution and application structure as Xamarin tools that you might have seen on the PC. In most cases, you will need to experiment and work around few hurdles to get their examples to work. Let’s hope that Microsoft will stay on top of their game and provide an awesome collection of MSDN resources once the final version of VS for Mac is released. 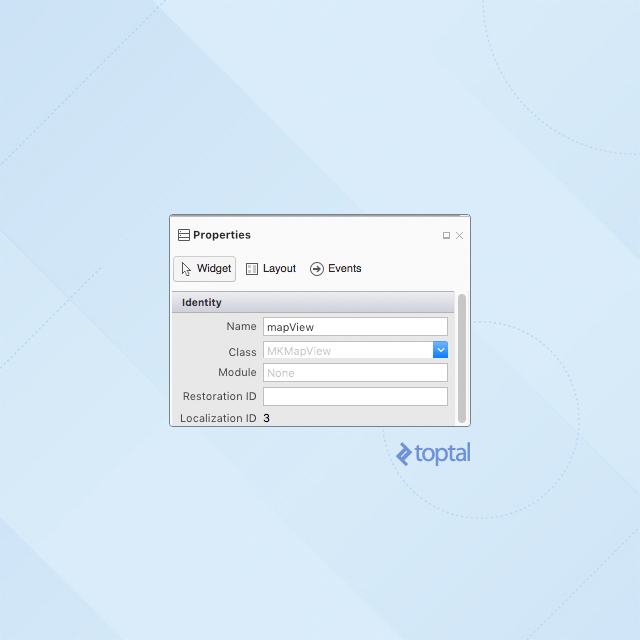 Accessing mobile device resources, such as current location, requires users to “manually” grant permissions to your app to use those resources. iOS uses the file info.plist to store these settings. VS for Mac provides a visual interface for editing this file. 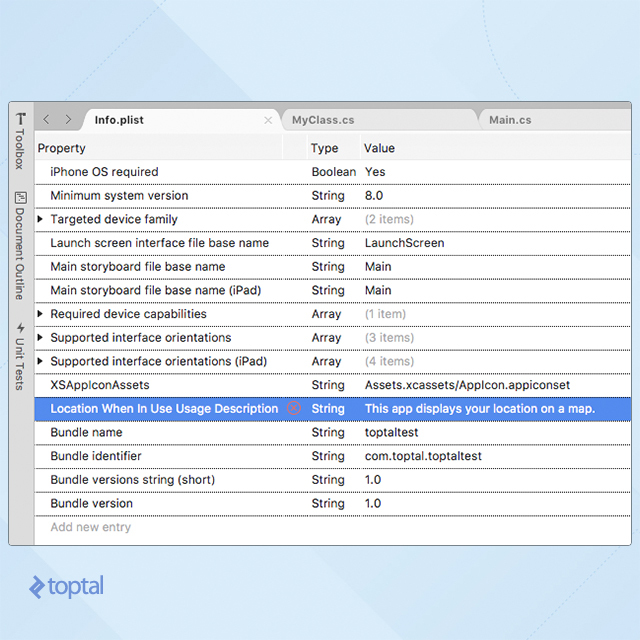 First thing we need to do is add a value for the setting named NSLocationWhenInUseUsageDescription. Note: VS will show a long name for “NSLocationWhenInUseUsageDescription” when you set the property name. This is expected and do not worry about it. 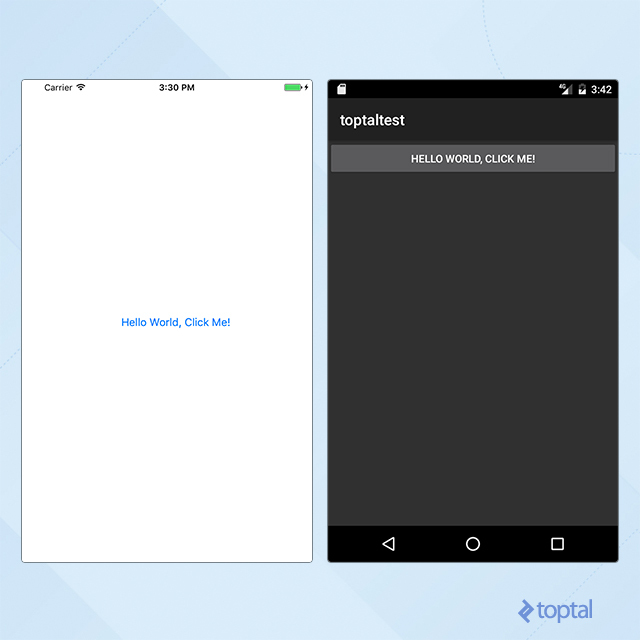 Our bootstrapped application was created with a simple button that was counting clicks. The first thing you will want to do is to remove it and replace the screen content with a map. In order to do this, look for the Main.storyboard file in the solution browser and double-click on it to open it in the editor. A storyboard is a visual representation of the user interface of an application, showing screens of content and the connections between those screens. A storyboard is composed of a sequence of scenes, each of which represents a view controller and its views; scenes are connected by segue objects, which represent a transition between two view controllers. Storyboards are introduced by Apple and adopted by Xamarin as well. Refer to Apple Documentation or Xamarin Documentation for more information. Remove the button and add a Map View component to the page. Make sure to name your “mapView” component properly. You can use the “Quick fix” feature to have VS automatically add a reference to the CoreLocation library or you can manually add it. After you run your iOS app you should see the request to access your location. Once the permission is granted your map will load with a standard blue dot showing where you are (or where you are faking to be by using the iOS simulator :) ). Unfortunately, Google and Microsoft decided to make this simple task a bit more complicated than it was with iOS. In order to use maps in the Android application, you will need to create Google Maps API key, and add it to your AndroidManifest.xml file. You are now ready to add a map to your application. The great thing with VS for Mac is that it is powered by NuGet, just like its big brother. As map handling libraries aren’t included by default, you will need to install the Xamarin.Forms.Maps package. As with iOS, you will need to configure your app to ask for proper permissions. To do so, open AndroidManifest.xml for editing and click the “Application” button on the bottom left side of the editor. VS will show you a visual interface for setting these values. There are a few of them you will need to enable, as shown below. Make your MainActivity also a ILocationListener. By calling the GetSystemService from within the OnCreate() method, your MainActivity will be activated as an ILocationListener and will thereby be able to handle all the events listed above. 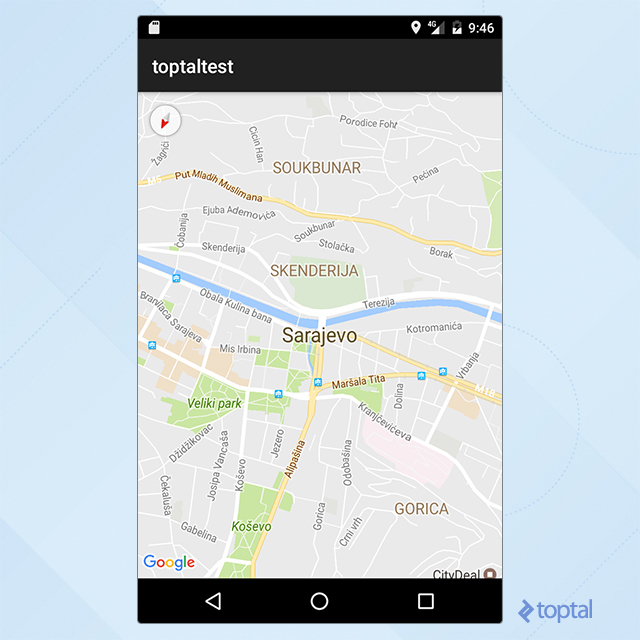 Run your Android application and you should get the map positioned to your location, similar to the following image. One of the greatest features of VS for Mac is the possibility of having shared code between iOS and Android apps. Ideally, we could have all the business logic of the app in a shared library, limiting any iOS and Android specific code to being part of the UI. 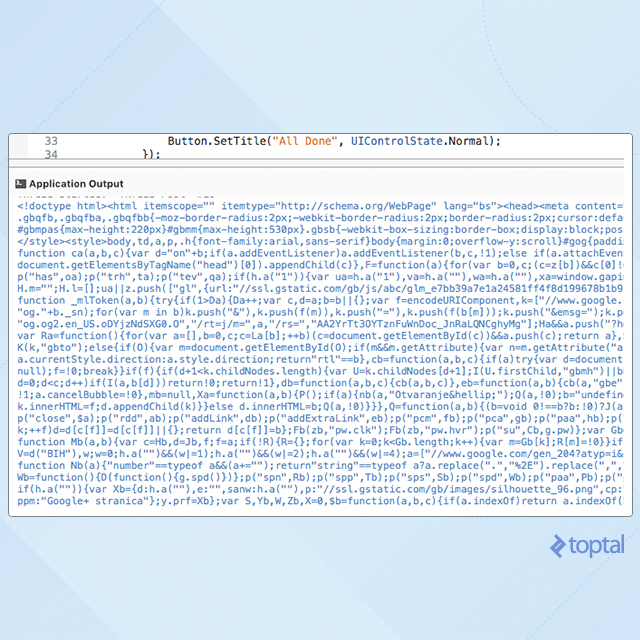 Let’s create a shared Class that will asynchronously perform an HTTP request and show the content in a Debug console. Note: The system architecture of both platforms, Android and iOS, requires that all UI interaction happen on the main application thread. This means that any change to UI elements should happen from within the main thread as well. That is where RunOnUiThread and InvokeOnMainThread come in. Since HTTP requests were executed in a separate thread and doneCallback() was called outside the main thread, we had to use these methods to be able to access the buttons and change the label. Visual Studio for Mac has still has a few wrinkles to work out, but from the first look at it, I’m very excited about its future. The need for mobile applications grows each day and, with Visual Studio for Mac, Microsoft has further enabled an army of great C# developers to fill in this need. Swift and Java/JVM now have a new, and very strong, competitor in the battle for our mobile device development environments. Related: .NET Core - Going Wild and Open Source. Microsoft, what took you so long?! Awesome! Thanks for sharing. I'm a C# developer and I've published iOS games in the past (PacDaddy3D) using Objective-C. It wasn't fun. Very good information shared here. It is very good that now we can make any android or ios app in c language or mac. So definitely it is going to help us a lot for sure. Thanks for the share.